A friend’s sister is expecting her first baby, a boy, and she wanted to give a baby quilt as her shower gift. As inspiration, she showed me a picture of her sister’s own baby quilt with a puppy theme. 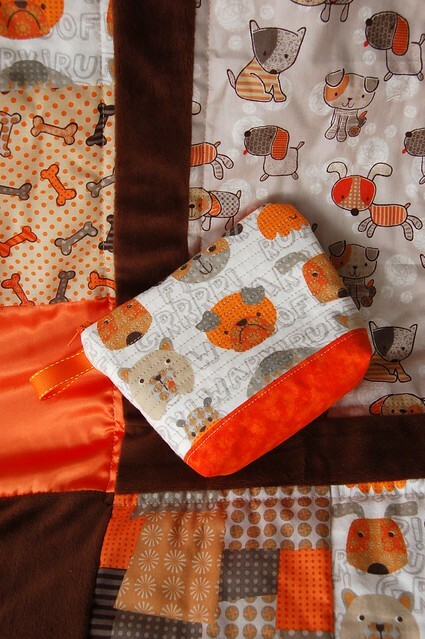 I found a cute puppy blanket kit that we both loved, then I added batting and binding to make it more of a quilt and give it better weight and strength. 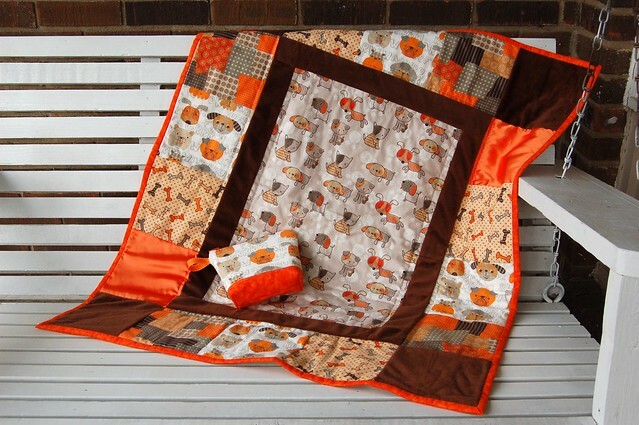 I loved the brown and orange, but WOW are minky fabrics and satins difficult to work with! (I won’t say I’ll never use them again, but it would take some strong motivation.) But the textures are so invitingly soft, and the minky, satin, flannel and cotton will be comforting and interesting as the baby starts to explore everything around him. And with some leftover scraps, I made a bonus quilted zip pouch. I LOVE LOVE LOOOVE IT ! :) Thank you so much ! You are sooo talented. :) and the best ! Hi Britty! Unfortunately, I don’t still have the directions, but after searching around online a bit I found this very similarly packaged quilt, and I think it must be from the same company: http://www.amazon.com/Fabric-Editions-Cuddly-Assorted-MDGAC-CQ10/dp/B0033P59UK I bought my kit from a JoAnn Fabrics. If you have one near you, they may copy the directions for you. Good luck! Thanks! I bought mine from a Joanns store as well, but they arn’t selling anything like it anymore. Although I did find the company that makes them from the link and they sent me directions. Thanks fof the help! !